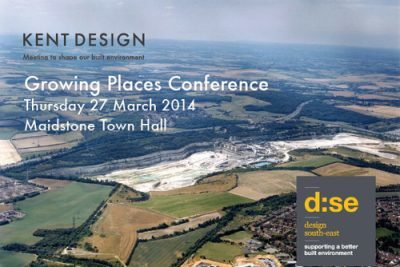 Design South East is pleased to announce the second in a series of topical Kent Design Conferences on Thursday 27 March 2014 – Growing Places in Kent and Medway. The Greater South East drives the UK economy and Kent plays a key part in this success, but with this comes increasing pressure for more homes. Current government projections indicate that the number of new homes in Kent will need to increase significantly to meet increased demand. So how do we grow communities as part of this increase and reinforce the character that makes Kent and Medway unique? This conference will explore growth can help to strengthen quality of place and will examine the role of planning, design and delivery for creating truly sustainable places. Kindly supported by Maidstone Borough Council, the event will take place from 8:30am – 4pm on Thursday 27 March 2014 at Maidstone Town Hall. Lunch and refreshments will also be included for the day.